The generally accepted picture of particle physics is known as the Standard Model. This collection of theories is the most successful physical model ever known and is able to make predictions that agree with experiment to unprecedented accuracies. For example, a quantity known as the anomalous magnetic moment of the electron can be calculated using Quantum Electrodynamics, which is one part of the Standard Model, and it matches with experimental measurements up to 14 decimal places. More or less, this means that one can zoom in by a factor of a trillion and the theoretical answer is still correct. The standard model is an example of a Quantum Field Theory, meaning that it describes several "fields" and lists the ways that these fields can interact. Each field describes a different type of fundamental particle, so really the Standard Model is a list of the fundamental particles and the ways that they interact with each other. One doesn't need to really know anything about field theory in order to understand the particle content of the standard model, so let's dive into that. Most of us are familiar with the concept of atoms and understand that they are made up of protons, neutrons, and electrons. However, if we zoom in closer, we learn that of these well known particles, only the electron is "fundamental," meaning that is isn't composed of smaller particles (as far as we know, of course). We should know a few things about the electron from high school. It has a property called "charge." The charge of the electron is -1, but that's just an arbitrary defintion of some units. The important point is that electrons are attracted to things with positive charge and repelled from things with negative charge (opposites attractive, likes repell, we see this among people as well as elementary particles). But what is charge really? Is there a more fundamental way to describe it beyond the ad hoc description above? Indeed there is. One a fundamental level, one can think of charge as the ability to interact with light. This seems odd, so let's qualify it a bit. Electrons interact with other charged particles via the exchange of light. Really, they interact with the smallest possible bunches of light known as "photons." It turns out that all forces come about as the exchange of a particle. For every force, there is one or more particle that is exchanged. When an electron comes near another electron, they exchange a photon which carries the message that they should repell each other, and so they do. So, charge is the ability to communicate with photons, and therefore anything that is charged can talk to anything else that is charged by sending out or receiving a photon messenger. The light that we see with our eyes is really just photon messengers talking to our rods and cones. There is an explosion in the sun. Two protons fuse together, and this process creates many photon messengers that go forth into the universe in all directions. Some of these messengers, after 8 minutes of traveling, hit the chemicals in our rods and cones and say, "There was a big explosion in the sun. Part of that explosion made red come this way in the form of me, the red photon." That's how we are able to know what happened 93 million miles away without feeling it with our hands. The photons told us!! Let's go a bit deeper. In addition to electrons, there are electrons' evil cousins: the positron. The positron is just an electron but it has positive charge. It weights exactly the same. Since they have the opposite charge, they attract each other: they exchange a photon and tell each other to come closer. How romantic. The positron is known as anti-matter because it has the opposite charge as the electron, which is matter. Of course, the distinction is arbitrary: if we were made of positrons, we would call the electron the anti-matter. When electrons and positrons touch, they can destroy each other and release a lot of photons in the process. It's a cataclysmic event and they need to send out lots of messengers to tell the world. We can produce positrons in particle colliders, and we readily do, but they are quickly destroyed since the world is full of electrons to cancel them out. The theory of electrons, positrons, and photons is known as Quantum Electrodynamics, or QED for short. It is a major component of the Standard Model. But really, it's quite simple. QED can be summarized by the fact that an electron and a positron interact via the exchange of a photon, two electrons interact via the exchange of the photon, or two positrons interact via the exchange of a photon. It's even simpler than that sentence if one understands Feynman diagrams (there's only one vertex between an electron, positron, and photon, and all possible interactions are built out of this one vertex like legos). 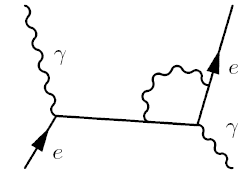 As you can see in the following diagram, each interaction vertex (where two lines meet) contains an electron and a positron (the two straight lines) and a photon (the wiggly line). Any such diagram that can be drawn that is made up of straight and wiggly lines where each wiggly line meets with two straight lines is a valid "Feynamn Diagram" in QED. If you aren't familiar with these sort of diagrams, don't worry, maybe I'll describe them in more detail in another blog. 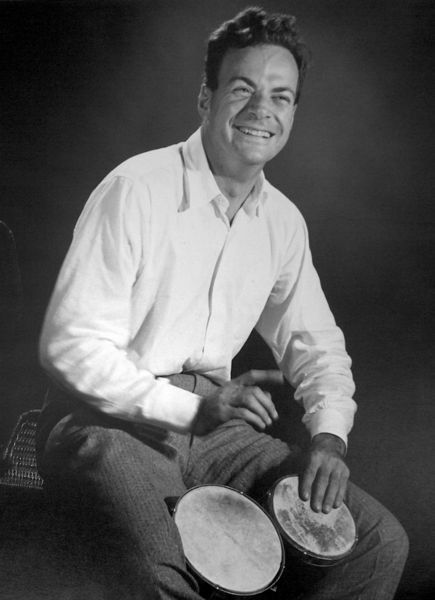 Richard Feynman, the man see above playing the bongos, was a central figure in the creation of QED in the 1970's. The other parts of the standard model are Quantum Chromodynamics (QCD) and Weak physics (which will merge with QED to form ElectroWeak physics). So, stay tuned.